I took this Debbie Stiehler bargello canvaswork piece at a Great Lakes Region EGA Seminar. The idea of creating a needlework object in the form of a pincushion instead of a framed piece fascinated me. I love the bargello stitch patterns and thread choices! 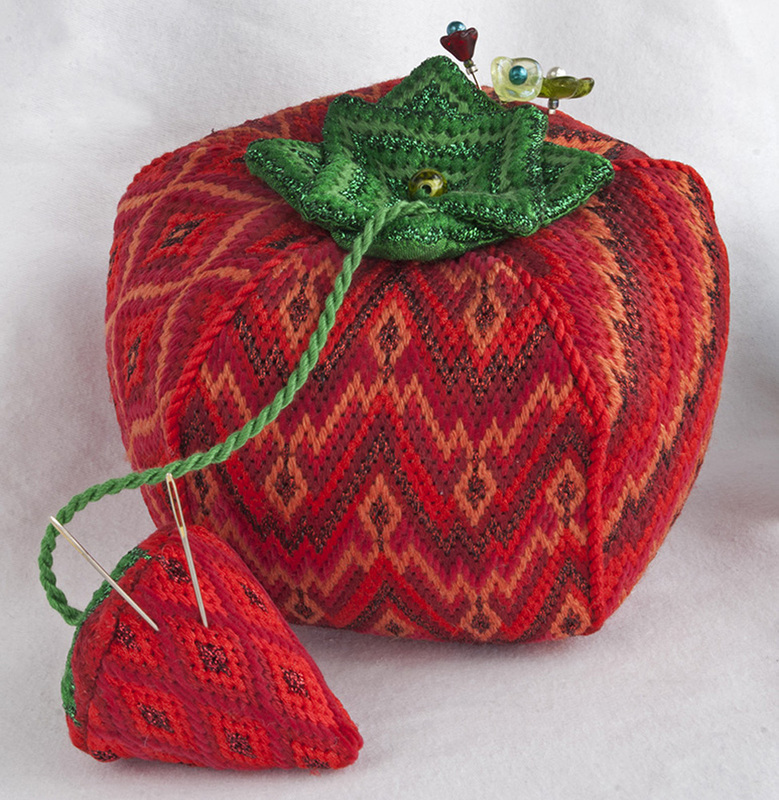 The tomato-shaped pincushion is designed on congress cloth with 5 oblong panels using 5 different bargello patterns. In all the patterns, Debbie mixes a wonderful variety of interesting threads such as Burmilana wool, Threadworx overdyed floss, Fyre Werks, Flair, Petite Very Velvet and Anchor flosses. As I was stitching the various bargello designs in the individual segments, I came to realize that a lot of the texture and interest came from the threads themselves and how they were used in combination to form the patterns. The added attractions of the attached leaves and the strawberry make the pincushion even more dimensional. Debbie Stiehler has taken inspiration from the classic tomato pincushion we all have in our sewing boxes and from it, voila!, has created a work of Art. Thank you, Debbie, for your wonderful class and continued creativity.